Groove Distribution :: :: Singles :: Downtempo, Leftfield :: Saucy Lady/MAKKA NA TAIYO 7"
Home : : Singles : Downtempo, Leftfield : Saucy Lady/MAKKA NA TAIYO 7"
Saucy Lady/MAKKA NA TAIYO 7"
SAUCY LADY (TUGBOAT EDITS, STAR CREATURE) offers a mind blowing new version of one of the biggest Japanese pop hits of the 60s. Funky phuture funk with vocals in Japanese. Flipside features a real slow burner cover of "AMAKU KIKEN NA KAORI" by TATASURO YAMASHITA. Produced by YUKI "MONOLOG" KANESAKA. 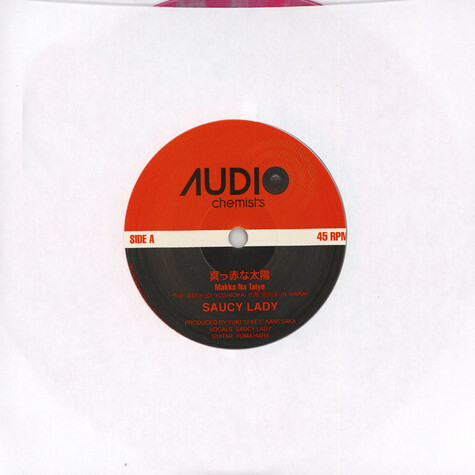 Honey Sauce Band/BOY TOY 12" Saucy Lady/EMOTION 12" Saucy Lady/IT'S ALL HERE 7"
Saucy Lady/MAGIC DUST 7" Saucy Lady/ON THE FLOOR & HELP 7" Saucy Lady/SATURDAY LOVE & HANG ON 7"
Saucy Lady/SUPANOVA (COLOR VINYL) LP Saucy Lady/SUPANOVA LP Saucy Lady/T-GROOVE REMIXES 7"